It’s one thing to dream of being a fashion designer, and another to take the first steps towards making that dream a reality. The truth of clothing design and entrepreneurship is that a lot goes on behind the seams (see what we did there?) and top fashion designers do a good job of making it look easy even when it’s not. But, that doesn’t mean clothing design has to stay a dream. Clothing design – like anything else – can be broken down into steps, and we’ve written up a 2000-word primer on getting started. If you want the quick and dirty version, download our one-page cheat sheet. Once you have that ready, you’re ready to approach development houses and manufacturers to get started on your first fashion collection. What do you mean by ‘development’? Development is one of three stages that goes into producing a fashion collection. The first is design, which we cover here under the assumption that you didn’t graduate from design school, the second is development, and the third is production. The difference between fashion design grads and people like you and me who didn’t graduate from design school is that design and development get more blurred. Here’s an example. A fashion school grad will arrive at development with fleshed out designs (never mind that they’ll undergo a lot of modifications). A woman who already has a career in finance but wants to start an athleisure line might approach a development house with just a concept or idea – and the development house will work with her on setting the stage for development. The challenge is that she might not know how to get started, and that’s where this guide comes in. Let’s put it this way: design is the summary of specifications that describe your collection, development is the building and engineering of your designs, and manufacturing is producing designs affordably at scale. Consider this guide technical design for non-designers, a nitty-gritty guide for the rest of us. Let’s get started and, if at any point, you need to take the dog for a walk or start dinner, you can always download our cheat sheet in an instant. Colors – what colors will define your concept? Do you have a sailor motif with navy blues and whites, or is your swimsuit line playing homage to spring with soft pastels? Go as specific as possible with Pantone color codes, but also get ready to be flexible if superior fabrics in other colors prevail. Either way, have a color palette in mind. Construction – how do you see your styles being constructed? A navy motif might require jackets to be double-breasted, a maternity line will need extra give at the waist. Are you inspired by the zipped up propriety of the early 60s or do you prefer the loose lines of the 90s? Fabric – what fabrics are you in love with? Your athleisure line may require moisture-wicking polyesters, your male beach line might be a natural fit for the briskness of linens, or your eco-friendly line might need all materials to be locally and sustainably sourced. Trims – whether it’s convenient pockets or frilly lace, start collecting examples of trims that are essential to the designs that inspire you. Reference samples – Reference samples, or physical examples of colors, construction, fit, or fabric, will be immensely helpful. Maybe a dress from Zara’s summer line captures the fit you want around the hips, or a thrift store jacket gets the collar you want exactly right. Don’t be afraid to go out and hand-pick clothes that inspired your collection and bring them to your development team. Artwork – do you want to incorporate graphics, appliques, or embroidery? If you don’t have anything specific in mind, at least have a general idea of what you’re looking for so a development time can help you source it. Throughout the process of gathering your inspiration, you might note that designers or specific themes and pieces pop up repeatedly. Pay attention to those: the designers will help you understand the target market and marketing strategies; the themes and pieces will help you put together your collection. As you look over your inspiration, you’ll start to understand who you’re designing for. Pay attention to this because it will become the foundation of your future marketing. Is it linen suits for vacationing, well-to-do men? Is it a party line for partying twenty-something women? Is it eco-friendly, organic clothes for toddlers? Your target market, especially in the beginning, should be as specific as possible and can help you hone your collection. Ask yourself, what do men vacationing in the Hamptons look for in their summer wardrobe? How can you help a woman stand out in an LA club? What do eco-minded mothers who like to dress up their kids look for in clothes? Encourage this back and forth until you hone a collection that both inspires you and makes sense to your target market. Now, take those designers who keep inspiring you and ask yourself two questions: how well are they doing and what can you do better than them? What are the competitors’ price points, trends and value propositions? Review your competitors’ success as a brand determine your sales and market potential. Now it’s time to come up with a collection. You want to approach your development team with a cohesively designed collection of possible outfits. 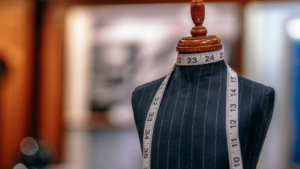 While you don’t necessarily need good sketches of all the garments – a full-service development team can help you with this – you will need detailed concepts. Now, let’s take a step back and get into the nitty-gritty. What’s your timeline for development and production? Every project needs a goal. Fashion collections are typically developed over 6 months in time to be ready for the new season. To get moving towards your goal, you’ll want to have a sample delivery date, a production delivery date, and you’ll want to time these with any investment rounds or marketing initiatives you have planned, for example, a website launch or a Kickstarter campaign. As always, work backward from important events, but make sure to allocate at least 6 weeks for development and 6 weeks for production. If you approach a manufacturer in May looking to launch a swimsuit collection in June, the manufacturer will first laugh at you on the inside and then charge you exorbitant rush fees. Decide, what are your priorities for your line? Price, quality, or speed. Rank them in order of importance and recognize that any two will require you to sacrifice the third. If you must have that swimsuit collection in a month, go big or go home, you’ll likely sacrifice price and to some extent quality. On the flip side, if you approach a development house in December for your summer line, you won’t have to sacrifice quality and you’ll be able to manage costs too. Ask yourself, what’s most important to you and what are your priorities given your timeframe? This is the hard part. What’s your budget? Are you self-funding your collection, raising angel funds from friends and family, or doing a crowdfunding campaign? Put another way, how much are you willing to risk on a new venture? Once you have a number, you can start putting together a development, manufacturing, and marketing budget. How many styles will you produce and how many units of each? A word of caution – it’s always better to start small and test your market. Even with competitive research, even with target market feedback, even with crowdfunding campaigns, there are a lot of variables that go into marketing and selling a new collection and you can never be certain how your first launch will go. It’s better to sell out than get stuck with extra inventory. Of course, the smaller the run, the more expensive your cost per unit, so you will want to find a happy place that gives you the data you need while allowing you to take advantage of some economy of scale. How will you size your collection? Does your collection require 10 sizes, or will a baseline of S, M, and L suffice? For new collections, simpler is always better. Now is the time to get into the specifics of your individual styles. Repeat this step for each style you’re planning. Give it a name. Give it a description. This will smooth communication and guide your team. The simple yet not so simple question which must be answered: what is your customer willing to pay for your product? Here’s where the above market research comes into play by looking at other products in your market, their price points, and the people who buy those products. Once you know your retail price points you can start to build out a budget for manufacturing costs, operations, marketing, and more. Generally, the manufacturing target cost is a standard fraction of your retail price, typically 1/3. These numbers will help guide you as you choose materials, trims, and more. Think of your reference sample as a baseline for your designs. Would you like your label to be printed or sewn in? What about the care label – should it be tear away or something custom? This is where you’ll share with your development team how much you want your final design to differ from your fit reference sample. What kind of changes do you want to make to it? Do you want to change any shapes, add or reduce length, remove or add details? At the end of the day, the reference sample is just a reference sample. Why did you pick it and just how meaningful is it to your final designs? Team: a team should include in the least a patternmaker and a sewer/cutter, preferably in one place to save time and money. The benefit to putting together your own team is that you will save money; the drawback is that it is inherently riskier and will require much more time and management. You’ll need to oversee everything and create a process that encourages good communication and minimizes costly mistakes. This can be extra challenging if your first collection is a side pursuit in addition to a full-time job. Development House: a development house is an in-house team of experts in sourcing, pattern making, cutting, sewing, and printing, etc. The benefit is that they likely have a wealth of experience and established relationships within the supply chain. They will be able to consult with you while expediting the development and manufacturing stages. The drawback is that they will be more expensive, but they’ll also be less risky. Next up? Development of your clothing designs! Once you have all of this down, your development team can get started on the hard work of sourcing and preparing samples of your styles – and you will start the hard work of turning your vision becomes a reality. That’s what we call development! At the end of development, you’ll have a tech pack, or final design specifications, and a salesman sample. Are you ready to get started? Download our cheat sheet today and start channeling your inspiration into your very own fashion collection.